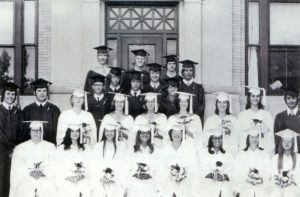 1st row: Wanda Backus, Donna Dygert, Connie Doty, Joni Clark, Linda Spencer, Cecelia Garceau, Bonnie Gollinger, Joanne Towne. 2nd row: Darren Colton, David Coloton, Deborah Morse, Coleen Hickok, Deborah Davis, Carol McCarty, Vicki Caswell, LouAnn Oelschlager, Kenneth Colton. 3rd row: Mark Rice, Roger Hatch, Christopher Jeffries, Charles Gregory TUpper, Timothy Gotham, Edward Lemelin. 4th row: Charles Starr, Jr., Morris Jeffries, Richard Dana.